Over one hundred twenty delegates and guests from 12 states and 2 Canadian provinces gathered at Grace Lutheran Church in Lakewood April 26th-29th for the triennial District Convention of the SELC District of the Lutheran Church-Missouri Synod. The Convention met under the following themes: "Love the Lord your God with all your heart and with all your soul and with all your strength" (Deuteronomy 6:5) and "Therefore honor God with your body" (1 Corinthians 6:20b). Among the guests was the Rev. Dr. Matthew Harrison, President of the 2.1 million member Lutheran Church-Missouri Synod (LCMS). The SELC District is one of 35 districts of the LCMS and is one of two that are "non-geographical." The SELC, once its own church body known as the Slovak Evangelical Lutheran Chuch and later as the Synod of Evangelical Lutheran Churches, merged with the LCMS in 1970. This year's convention marked the second time in the history of the SELC as a district of the LCMS that the convention was held in Lakewood. There’s a new ministry in town: Good Soil Lutheran Ministries is one of the newest congregations of the Evangelical Lutheran Church in America (ELCA), created through the consolidation of Faith Lutheran Church in Lakewood and Our Savior’s Lutheran Church in Rocky River. Trinity Lutheran Church is a congregation that was founded in 1912 in a rented chapel on Andrews Avenue and was to be in ministry with English speaking Lutherans residing in Lakewood. The name became Trinity Lutheran Church in 1921. The building to be deconsecrated was completed in 1922, the education unit in 1953, interior renovations to the sanctuary in 1966, and muraling throughout in 1999 by members under the leadership of member artists. Leaving a church building is an occasion filled with mixed emotions of varying degrees. There is grief and nostalgia about what has gone before, as well as hopefulness for the future. Trinity Lutheran Church has called a new pastor, the Reverend Sara Cogsil, and together they began serving alongside one another on August 15, 2017. They will officially mark the occasion with Pastor Cogsil’s installation service to be held on Sunday, November 12 at 4:30. The installation service will be led by Bishop Abraham Allende and will be held in the chapel of Lakewood Congregational Church, Trinity’s future home. Grace Lutheran Church, located at the corner of Madison and Grace Avenues in Lakewood across from Madison Park, will be celebrating the 500th Anniversary of The Reformation on SUNDAY, OCTOBER 22ND, AT 4 PM. The service will feature a processional by Lutheran Church-Missouri Synod (LCMS) clergy, a procession of banners made by congregations from Ohio and Pennsylvania, special music by The Lutheran Wind Ensemble an adult mass choir, and the bell choir of Grace Lutheran Church. The entire Greater Lakewood Community is cordially invited to attend this once in a lifetime celebration. On Saturday, May 6th, Grace Lutheran Church, located at 13030 Madison Avenue in Lakewood, will once again present their “Grace-est Show on Earth.” This annual event features carnival-style games with prizes, face-painting, balloons, and a bounce-house. Children ages 4-12 are assured of having a wonderful time. Building Hope in the City plays a key role in the event through its City Serve program which utilizes high school students from the Greater Cleveland area in assisting with servant events around the city. Students involved with City Serve will be supervising the carnival games as well as assisting the congregation with a couple of projects around the church. On May 1, the Rev. Dr. Charles Yoost will arrive at Lakewood United Methodist Church as Interim Pastor, following the ten year pastorate of the Rev. Bruce Hartley. Dr. Yoost was Senior Pastor at Church of the Saviour in Cleveland Heights for seventeen years, where his sermons and “Thoughts for the Day” were broadcast on radio stations WCLV, WHKW and WDOK. He is a frequent workshop leader and guest preacher. In November, 2016, he led seminars on “Discipleship and Church Renewal” and “Pastoral Ministry – Past, Present and Future” at his Alma Mater, Boston University School of Theology. On the eve of Easter Sunday, Faith Lutheran Church will offer baptism to anyone who desires it for themselves or their child. The baptisms offered at the Easter Vigil service on April 15 are especially intended for those who desire baptism but aren’t presently part of a Christian community. The community baptism service will begin at 7 p.m. and last about 45 minutes to an hour, with scripture, simple songs and the baptisms. A celebration with Easter Sundaes and other desserts and refreshments will follow. All are welcome to attend and participate in worship. People who would like to be baptized or would like their children baptized, must contact Pastor Mark Rollenhagen in advance by calling Faith at 216-226-6500 or e-mailing him at pastor@faithlakewood.org. They also must arrive at the church by 6:30 p.m. for a half-hour conversation about baptism before the service begins. Grace Lutheran Celebrates Mission Festival With "Common Threads"
Grace Lutheran Church, located on the corner of Grace and Madison Avenues across from Madison Park, will host a Mission Festival on Sunday, March 26th. The Guest Speaker for the occasion will be Mr. Jeff Stredney, director and founder of Common Threads, a unique ministry of Building Hope in the City. The national office of the United Church of Christ (www.ucc.org) released an adult education curriculum in 2016 titled "White Privilege: Let's Talk" that invites local UCC churches and their members to engage in safe, meaningful, substantive, and bold conversations on race. For some of us, the statement “It’s the most wonderful time of the year” couldn’t be further from the truth. With all the decorations and merriment December brings, the day we’re most anxious for is the 26th. Grief, apathy and hardship can make the Christmas season anything from annoying to unbearable. So this year, instead of focusing on Christmas day, concentrate on Advent. Advent isn’t about presents, trees, dinners and decorations. It invites you to a place of quiet and reflection. And it challenges you to both look into and past your circumstances. “Hope is the power of being cheerful in circumstances that we know to be desperate,” writes G.K. Chesterton in an essay discussing virtues.1 The difficulty of this statement is obvious. Desperate circumstances seem to call for despair, not hope. In the year and a half since having my son, I have received a wide range of parenting advice (some solicited and some not), but the most helpful advice was also the simplest: “Just love him lots.” It sounds easy but has proved to be unexpectedly challenging. From sleep training to tantrums, I find myself regularly wondering how best to “love him lots.” Is it through discipline and firm boundaries? Is it through tenderness and letting go of my plans for the day? Most often I have found the truest love to be somewhere within a difficult balance of many extremes. We are fast approaching a season of light. From the twinkle of Christmas lights, to the flicker of Advent candles, to the metaphorical glow on children’s faces, we are coming upon a time filled with light. However the irony isn’t lost: the days are shorter, the nights longer, and a cloudy gloom is building over the lake. The winter darkness is settling and Advent comes during the bitterest of those times. Spunky. Perseverant. Patient. Adaptable. Loving. Kind. Open Armed. Home. These are all words that describe, Calvary United Methodist Church. Calvary has gone through a lot over the years: Fires, broken windows, broken ovens, new pastors, parishioners coming and going, debating whether or not it’s the right choice to close, however; here we stand. At the corner of Northland and Hilliard, a beautiful brick building, beautiful trees in the front yard, a wittily worded sign and a little family of faith inside. Calvary has seen its ups and downs but we have refused to give up. We provide the community with as much as we have in us and we want you to know, we’re still here. And we’re planning on staying. So why not familiarize yourself with everything we have to offer? A free Carnival every spring, with bounce houses, free food, games and prizes; outdoor praise services in the summer, a prison ministry which provides the children of inmates Christmas gifts and a big Christmas party, crafts fairs (We’re having one on October 22 from 10-2! ), 4th of July parades, community meals, and an open pantry of toiletries, along with food and clothing located at the churches next door and potlucks galore. We open our doors to any and all. If you are looking for a place to fill your heart, to energize your spirit and give you the opportunities for love and kindness that you’ve been looking for, we’re the place. The congregation and Pastor Nick are ready to set things in motion this year and we hope you remember that Calvary is booming on the inside and we are coming outside to the community to make sure you know we’re here! Lakewood is abundant in churches, but there is only one Calvary United Methodist and we may be exactly what you need. Grace Lutheran Church, located at 13030 Madison Avenue across from Madison Park, kicked off Children's and Youth Bible studies with their annual Rally Day. Rally Day is a tradition started from the early 1900's to welcome back families from summer and to kick off a new year of Bible study. Grace Preschool, located at 13030 Madison Avenue in Lakewood across from Madison Park, will be hosting a Preschool Open House & Ice Cream Social on Thursday Evening, August 4th, from 6:30 to 8 p.m. This event is for families with preschool age children. Plans are in place for two summer Bible camps for kids offered by Faith Lutheran Church, Lakewood, and its ministry partners. Steve Sink, the owner of Belle Barber, was cutting my always-overgrown curly hair. “I think I saw you in your robes the other day with your congregation out in the courtyard of the church.” “Was it a wedding?” I asked. “Perhaps,” he replied. “Were we walking around with Palms?” I continued to guess. No, that wasn’t it. “Was there a lot of smoke? Was I lighting a fire?” He wasn’t sure. After some conversation we settled on the idea that it must have been a procession of some sort, the haircut continued, and the conversation moved on. On Sunday, December 6th at 7 p.m., St. Luke Church will celebrate an Advent Family Prayer Service to include a Procession of Creation, Scripture, prayer, and song featuring the St. Ignatius High School Music Chorus and the St. Luke Choir. All are very warmly welcomed! A Social will follow. Lakewood United Methodist Church hosts 2015 Vacation Bible school! The pet-friendly, midsummer outdoor worship series offered by the PLUM (Presbyterian, Lutheran, United Methodist) congregations of southwest Lakewood kicks off Wednesday, July 8, with “Dog Night” at the gazebo in Lakewood Park. Grace Lutheran Church is making final preparations for its fifth annual Community Days, which will take place the week of June 22, 2015, “under the tent” on the lawn in front of the church. “Child of God, you have been sealed by the Holy Spirit and marked with the cross of Christ forever.” -- from the Lutheran Book of Worship. A Good Friday afternoon service returns to Faith Lutheran Church this Holy Week. When I first joined the Anglican Church, I felt a bit like a schoolchild who showed up for a vocabulary test and hadn’t been privy to the study materials. As someone who had attended church her entire life and felt well-educated, there was an element of unexpected culture shock. Thankfully I was not being graded, and I had teachers not only willing but excited to help me learn these new terms. I began to understand the foreign traditions, their roots in both scripture and the traditions of the ancient church, and they enriched my faith in new ways. One of these learning experiences was the service of Tenebrae, which I attended for the first time last year. The word “tenebrae” is Latin for “darkness” or “shadows,” and it describes the service well. A tradition established during medieval times, Tenebrae takes place during Holy Week, occurring on different days of the week depending on the Christian denomination. Holy Week is full of traditions that are sensory – the washing of feet on Maundy Thursday, partaking in remembrance of the last supper, the songs of joy on Easter Sunday. Tenebrae is a very visual service, gradually plunging the congregation into darkness as it progresses. Tenebrae, at its core, is a funeral ceremony. A dark sanctuary is lit only by candles, and passages of scripture are read that address the suffering of Christ during the last days before his death. Yes, friends, cold and flu and more cold and snow. It is time for SOUP! Trinity Lutheran Church is holding a fundraiser Sunday, March 1, from 11:30-1pm. Amazing soups from mom's recipes to that yummy, spicy Thai dom yam will be ready for you to take home! Chili, too. Pint and quart containers will be available. Some pop up shops might be in Trinity's Community Room as well. Enter through the rear/north door. In January the chili fundraiser brought in monies to assist a neighbor needing a new boiler. March is set for funds dedicated to the "Pastor's Discretionary Fund". This fund assists folks in need of rent, emergencies, temporary housing, and bus tickets. So many folks come to churchc doors these days. Often churches are their last resort. 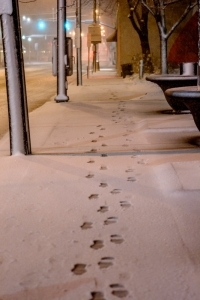 Referrals and resources are also provided to those whose next step might be sleeping outdoors. This winter is no time for being outdoors overnight! Lakewood is a wonderful place to live year-round, but there is something special about the Fall and Christmas time. Whether walking in the Metroparks or down the multi-colored canopy of one of our charming streets, this is a special time in our city. 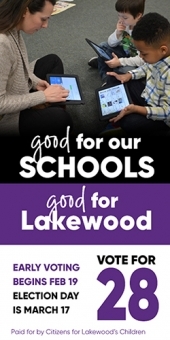 I moved to Lakewood in 2010 but it has taken me some time to find all that Lakewood has to offer, despite my periodic reading of The Lakewood Observer. For the last several years friends and I went on the Chocolate Walk put on by Lakewood Alive and last year a group of us went Christmas Caroling through the Downtown Detroit Avenue business district. Lakewood Anglican Church was dedicated as mission church of the Anglican Church in North America (ACNA) at 5 p.m. on October 5th, 2014. The Archdeacon of the Great Lakes Diocese of the ACNA, Reverend Mark Scotton, was present as a representative of the Diocese and delivered the sermon. The dedication marks a shift as Lakewood Anglican moves from holding monthly services, which began in March of 2014, to holding weekly services. Services are held Sunday evenings at 5 p.m. at Gethsemane Lutheran Church, 14560 Madison Avenue, Lakewood. Grace Lutheran Church, located across from Madison Park at the corner of Madison and Grace Avenues, will celebrate their annual Rally Day under the theme "Be Bold" on Sunday, September 7th. The Greater Lakewood Community is invited to join the congregation on a day typically reserved to celebrate and advance the Christian Education ministries of the congregation and to set the ministry direction of the congregation in the new program year. The big white tent goes up on the front lawn of Grace Lutheran Church on Monday, June 16th, serving as a prelude to a week of activities to which the entire Greater Lakewood Community is invited. The church, located at the corner of Grace and Madison Avenues across from Madison Park, has hosted evangelistic and community activities under a tent in mid-June for the past 8 years. More than 50 youth in grades 7-12 will spend the morning on Saturday, May 3, helping the Lakewood community through the Keep Lakewood Beautiful organization. As part of the Spring Youth Gathering, an annual event for teens sponsored by the Episcopal Diocese of Ohio. The kids will lend a hand with clean-up and Earth Day activities, including cleaning city sidewalks, and downtown parks, litter pick-up, collecting household waste for recycling, and planting flowers and trees. This year's Spring Youth Gathering is hosted by the Church of the Ascension in Lakewood, and will commence with program activities on Friday evening, the Keep Lakewood Beautiful project on Saturday morning, followed by a concert by notable Christian rock band, The LivingStones. Having released their first full-length album, "Glow," in 2011, the band has been a part of worship services and youth gatherings in the US and Mexico, and performed at The Big Ticket Festival, a three-day Christian music festival which hosts more than 10,000 people per day. Lakewood United Methodist Church will be moving into its new sanctuary on Easter Sunday, April 20. After only four months of intensive work, a beautiful new worship space has emerged. It features a large stage which can be used for many different kinds of musical and drama programs and an area for the congregation with moveable chairs, in addition to traditional pews. Nearby is a fellowship area and a cafe with coffee and refreshments available. The Museum of Divine Statues is offering guests the opportunity to visit on Sunday, December 8, for half price admission, $4, to honor the Feast of the Immaculate Conception and to celebrate the Christmas season. The museum hours are noon till 4 p.m. with the reciting of the rosary, led by Father Ron Wearsch, at 3:00 p.m. The museum is located at 12905 Madison Avenue in Lakewood, Ohio. For additional information, call (216) 228-9950. The museum is open each Sunday from noon until 4 pm. Group tours are available during the week upon request. Make a visit to the Museum a part of your holiday tradition. Grace Lutheran Church, located across from Madison Park on the corner of Grace and Madison Avenues in Lakewood, will be celebrating their Sunday School Rally Day on September 8th with a special guest. Mark Rein, radio personality at WFHM 95.5 The Fish, will provide contemporary worship music and the message at the 10:30 a.m. worship service. He will also bring greetings and a brief presentation to the Sunday School Children & Staff during the Sunday School hour beginning at 9:15 a.m.
St. James in Lakewood is celebrating the first anniversary of the reopening of its parish on Thursday, July 25. The festivities will begin at 7:00 p.m. with Mass. A reception will follow immediately afterward in the courtyard. Kristie the balloon-twister will be on hand to make balloon animals for the kids. This event is free and open to the public. Come and celebrate this happy occasion with us. It’s that time of the year again when Grace Lutheran Church of Lakewood puts up a big white tent on their front lawn and holds activities and services to serve the community in the Name of Jesus Christ. In years past, the congregation has hosted a three-day evangelistic crusade, but this year they are trying something a little bit different. Instead of being a blessing to people only, they will seek to be a blessing to people’s pets as well. The Greater Lakewood Community is cordially invited to come to a Blessing of the Pets service on Tuesday, June 25th at 7 PM under the tent. Grace Lutheran Church is located across the street from Madison Park at 13030 Madison Avenue. All animals are welcome! The Rev. George Hansell, Pastor of Grace, requests that the owners please ask their animal companions to be well-behaved. The story of young Isaac Monah's escape from the war torn nation of Liberia in 1989 and of his subsequent arrival in America, is in and of itself a story of biblical proportions. When civil war erupted in Liberia in 1989, the Monah family fled to the Ivory Coast where Isaac worked for a time in the Tai National Forest where he met Scott McGraw who helped him emigrate to America. Isaac settled in Philadelphia, and eventually moved to Cleveland Heights where he began attending Noble Road Presbyterian Church. In 2007 Isaac returned to a Liberia still recovering from the wounds of the war, and recognizing that one of the resources unavailable to those living in the Konobo district of Liberia was education, Isaac embarked on a crusade to bring a school to the citizens of the Konobo District of Liberia, the rural area which was his home. Returning to Noble Road, he allied himself with several resourceful church leaders including: Pastor Francis Miller, John Luttermoser, Ted Roos, John Benko and others; together they formed the organization that became known as the Dougbe River Presbyterian School of Liberia or DRPSL. As Episcopalians, we are followers of Jesus Christ, the second person of the Holy Trinity. During this time in the calendar of the Episcopal Church, we celebrate the “Great Fifty Days of Easter.” Also called, “Eastertide,” this is the period lasting from Easter Sunday to Pentecost Sunday. These fifty days represent an especially joyful time for us as we remember the wonderful gift of Jesus’ salvation given to the whole world in His life, death, and rising again to new life. The seven Sundays of Eastertide are commemorated at The Church of the Ascension, here in Lakewood, at 13216 Detroit Avenue by the seven crosses dressed in white and adorned with flowers. These same crosses had been dressed in purple during Holy Week and used in a rite of the church called “The Way of the Cross” on Good Friday. Jesus’ victory over sin and death is now celebrated with crosses that shine white. During Eastertide, we also celebrate the feast of the Ascension of the Lord, the festal day of our own church, and one of the “Principal Feasts” of our faith tradition. "Put Your House In Order"
You are invited to a special presentation to be made at Lakewood United Methodist Church on Sunday afternoon, March 3 at 12:15 p.m."Put Your House in Order" is the topic, which will focus on plans for leaving your estate and personal affairs in order at the time of death. There is no charge for this event, and there are no reservations necessary. Leader for this seminar will be Dr. William McFadden, a retired United Methodist pastor. Dr. McFadden frequently serves as an adviser to individuals and local churches on matters of Christian stewardship. The church is located at 15700 Detroit Ave., at Summit, in Lakewood. For additional information, call 216-226-8644. Carolyn Rummery is in charge of publicity for Lakewood United Methodist Church. Grace Lutheran Church, located across from Madison Park at the corner of Madison & Grace Avenues in Lakewood, is celebrating its 10th Anniversary in 2013 under the theme “More Grace to Come.” “The congregation is planning a number of special worship services, servant events, and other activities during the course of the year,” says the Rev. George R. Hansell, Jr., who has served the congregation for eight years of its ten-year history. The congregation came into existence on January 1, 2003 when the congregants of Pentecost Lutheran Church and Saints Peter & Paul Lutheran Church, both of Lakewood, decided to come together as one congregation to more effectively carry out mission and ministry in Lakewood. The congregation adopted as its mission statement, “Grace Lutheran Church shares the Good News of Jesus Christ with all people.” To help advance that mission, in 2008 the congregation organized Grace Preschool under the auspices of the Lutheran Development Ministry of Lakewood, a separately incorporated entity of the congregation. The congregation will celebrate the fifth anniversary of the preschool ministry in a special service on April 28. In nearly 14 years since her son's death, Rachel Muha of Westerville, Ohio, has learned much about walking the path of forgiveness, even in the face of tragedy and adversity. The eighth annual Dorfmeyer Memorial Advent Concert is set for Sunday, December 9, at Faith Lutheran Church. The concert will feature pianist David Robison playing the music of George Gershwin. The music begins at 3 p.m. and will be followed by a gala reception in the church's Ada Doepker Lounge. A freewill offering will be accepted. Faith is at 16511 Hilliard Road (at Woodward) in Lakewood. Mark Rollenhagen is the pastor of Faith Lutheran Church in Lakewood. "God calls us to reach out to the spiritually and physically hungry." The Calvary United Methodist Church will complete her year-long celebration of 100 years of mission and ministry in the name and for the sake of Jesus Christ at a special banquet, program, worship service and potluck dinner to be held on the evening of Saturday, November 10 and the morning of Sunday, November 11. The Saturday evening banquet and program will begin at 6:00 PM and will feature a catered meal, remarks from former pastors, a power point presentation and the singing of the "Ambassadors." The "Ambassadors" will be coming to Calvary and Lakewood from Detroit. In addition to sharing the love of Jesus through song, the "Ambassadors," a group of men who have overcome great challenges in life, will praise God through personal faith testimonies. They are and they will be an inspiration to all who see, hear and interact with them. The following morning, at our 11:00 AM worship service, their pastor, the Rev. Dr. Faith Fowler, will deliver our morning message. Rev. Fowler, who is the executive director of Cass Community Social Services in Detroit, is the senior pastor of the Cass United Methodist Church and is a preacher in great demand. Cross Point Church will be hosting a marriage conference Friday and Saturday, November 2-3, 2012. The Art of Marriage event is a video guided conference divided into six dynamic sessions. This event will provide couples with the opportunity to grow and strengthen their marriage relationship. Location for the conference will be held at The Winchester Music Hall, 12112 Madison Ave. The event runs from 7 - 9:30 p.m. on Friday, November 2 and 9 a.m.- 4 p.m. on Saturday, November 3. Total cost for the conference is $40 per couple, which includes manuals, refreshments and lunch on Saturday. Registration deadline is October 15. Visit www.crossptchurch.com for more information. A half day retreat entitled "We Remember How You Loved Us" will be held at St.Clement Church, 14401 Madison Ave. on September 11, 2012. Sponsored by the Lakewood Cluster Parishes consisting of St.Clement, St. James, St. Luke and Transfiguration Church. The day will begin at 9:00 a.m. with Continental Breakfast served in St. Clement Hall where the Rev. Joachim J. Pastirik, O.S.B. will talk about forgiveness and remembrance. Next we will move to the Church for Mass and Anointing. We will conclude afterward with a catered hot chicken lunch back in the hall. Elevator available. Cost for the retreat is $10.00. Lakewood United Methodist Church, 15700 Detroit Ave., invites all children 3 - 11 years of age to get ready to dive into fun at Operation Overboard: Dare to Go Deep With God. Dive in and discover God's underwater universe at Vacation Bible School, July 16 - 20 from 9:30 am - 12:00 noon. Lakewood United Methodist Church, 15700 Detroit Avenue, is partnering with LakewoodAlive for a summer mission project that continues the work begun in its "Change the World" project. They are identifying Lakewood homeowners in need of yard work, painting, porch repair, and other maintenance. More than 80 youth, adults, and children from Lakewood United Methodist Church, 15700 Detroit Avenue, fanned out from one end of Lakewood to the other as part of the global "Change the World" effort on May 20. The Lakewood church partnered with the local community development organization, LakewoodAlive, and the Department of Aging to identify houses that needed extra care. A total of thirteen houses received care in the form of yard work, mowing, weeding, and planting. Lakewood United Methodist Church, 15700 Detroit Ave., will be changiing the times of its Sunday worship services as of June 17. The new times will be: 8:30 a.m. Awakening contemplative service in Yoder Chapel; 9:45 a.m. Traditional service in the Sanctuary; and 11:05 a.m. Impact service in Daniels Hall. For additional information, call 216-226-8644. Ministerial Musings: "Out of This World"
by The Rev. Dr. John Tamilio III, Ph.D. Many moons ago, when I worked at Salem State University, I had a colleague named Steve who was a Born Again Christian. Steve took every opportunity to tell others about his faith, how he was saved by Jesus, and if others (namely his colleagues) wanted to be saved, then they needed to accept Jesus Christ as their personal Lord and Savior as well. What he really meant was that we had to believe exactly the things that he believed in order to be part of the club. Lakewood United Methodist Church located at 15700 Detroit Avenue in Lakewood, will join with other United Methodists on May 20, 2012 in the Change the World movement. Members all around the globe will be in service with simple acts of kindness to build community locally and to fight malaria globally. Lakewood United Methodist Church will participate with the Lakewood Department of Aging and Lakewood Alive to go to homes around our community to help with mowing lawns, cleaning and pruning flower beds, and planting flowers. I write these words from the waiting room of Beverly Hospital in Massachusetts. My father is still in surgery for blocked, carotid arteries. As some of you know, my Dad recently had a stroke — his third in recent years. He also had a couple of heart attacks and suffers from severe diabetes. His doctor informed him that if he did not have this surgery, he would more likely than not have a massive, fatal stroke in the near future. The surgery, though, is risky and comes with no guarantees; he could die on the operating table. Tenebrae: A Service of Darkness by contemporary composer Hal H. Hopson will be offered at the Community Service at Lakewood United Methodist Church on Good Friday, April 6, at 7:00 p.m. It will feature combined choirs from Lakewood churches, organ, oboe, and strings. Dr. Gene Willet will direct with Hal Lissow at the organ. Everyone is invited to attend this special evening. The church is located at 15700 Detroit Ave., at Summit. For additional information call 216-226-8644 or visit www.LkwdUMC.org. Love, heart health, and Lent seem to be February notions. With Valentine’s Day and Heart Health Month, our culture has connected the old love holiday with red blood cells and heart arteries. It’s a good match…a connection between what some call a “Hallmark Holiday” and a current reality. The culture sees red in February and realizes more and more that the stresses of life and heart attacks are connected. And why not? All that chocolate will definitely affect weight and weight affects heart health (or lack of health as the case may be). And you know those diamonds are found/mined by people so poor they will never own even one uncut rough…maybe not even a hut…and might be killed if they try to keep a piece of their find. Ministerial Musings: What Is Lent? by Rev. Dr. John Tamilio III, Ph.D.
Take a look at Matthew 4:1-11. This is the text around which the Christian Church modeled the Lenten season. Jesus journeys into the wilderness right before he begins his public ministry. He is tempted by Satan for forty days and forty nights. This is it: Lent is about to begin. February 22 is Ash Wednesday, the start of the Lenten season. Many people will gather in sanctuaries and cathedrals across the world to share the bread and cup of Holy Communion and to receive ashes on their foreheads to mark the start of our contemplative journey. I recall that my Catholic childhood friends had to give something up for Lent, be it chocolate, or television, or drinking soda. The idea was to identify with the sufferings of Christ. “How does denying ourselves a Hershey bar and a can of Coca Cola help us identify with the crucifixion?” I remember asking myself. Although I better understand how denying one’s self a routine pleasure is a spiritual practice, it made little sense to me as a child. They are the fundamental questions asked by any journalist: Who, what, when, where and why? Those 5 W’s will provide the basis for an exploration of the Christian faith, beginning Saturday, March 3, at Faith Lakewood, at the corner of Hilliard and Woodward in southwest Lakewood. In five sessions, we will examine the roots of Christianity in the world’s broader search for meaning and understanding and explore the development of basic Christian principles and practices and how they do – or don’t – have relevance for today. Faith Lutheran Church is going to the dogs – and cats and other pets that will be welcome at a new Sunday afternoon worship service. Faith’s first pet-friendly worship service will be held at 2 p.m. on Sunday, March 4. After that, the service will be offered on the first Sunday of each month and possibly more frequently if there is interest. Pets and their owners will gather for worship on the tiled floor of Fellowship Hall in the church’s lower level. The best entrance is the one facing Hilliard Road, near the driveway exit. When the weather warms, the service will move out to the lawn.